Hot on the heels of its first 3K laptops, MSI has revealed new GT270 2OK and GT602K CAD Edition models, promising faster and more stable performance for professionals. The new models were create for professionals such as designers, architects and video production houses, according to MSI's vice president of sales Eric Kuo. 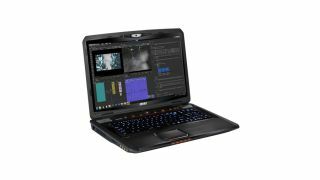 MSI's CAD laptops are certified by Autodesk, Solidworks and other independent software vendors and arrive with Nvidia Quadro K3100M graphics and models in 15.6-inch and 17.3-inch variants. Both MSI CAD laptops support multi-display modes of up to four independent high resolution monitors – through Mini Display, HDMI, D-sub and the laptop's own screen. The 3K resolution IPS screen of the MSI CAD laptops support pixel resolutions of up to 2880 x 1620 with a 1000:1 contrast, and promise 14 per cent more clarity than FHD. MSI promise that they will give professionals a "stunning visual experience". Both laptops feature USB 3.0 and 2.0 ports, 1TB of HDD memory as well as up to 384GB of RAID 2. A steel series keyboard backlit in multiple colours give each a futuristic glow, while a 720p HD webcam sits atop the impressive screen. Owners have a choice of Windows 7 or Windows 8 to suit their needs. The included Nvidia Quadro K3100M, according to a benchmark test, delivered 50 per cent better results than a desktop Quadro 5000 while running Solidworks, and a range of between 10 and 20 per cent better results running Maya, Creo and Catia. Combined with this remarkable graphical fidelity is an Intel Core i7 and 4GB of GDDR5 memory. MSI has tailored their new GT270 2OK and GT2602K CAD laptops towards professionals and designers, and they certainly don't seem to disappoint. TechRadar has contacted MSI for global pricing and availability.